The TravelMate 4720 shows why Acer is keeping other notebook manufacturers up at night: It's a solid business portable at a very attractive price. Granted, this thin-and-light doesn't have every feature a buyer might want--there is no wireless broadband option or webcam, for instance--but it's got enough features and performance to make its $999 price very enticing. Like the consumer-oriented Aspire 4710 we recently tested, the TravelMate 4720 employs an industrial design by BMW Group DesignworksUSA. At 5.6 pounds and 1.6 inches thick, the TravelMate 4720 isn't the sveltest thin-and-light, but the rounded edges and matte charcoal-and-black color scheme are an improvement over Acer's previous plasticky slabs, though the look still won't turn any heads (which is likely fine for a business box). Business laptops are designed to be bland, conservative, and unnoticeable in a busy work environment—but can this be taken too far? The Acer TravelMate 4720-6727 ($1,049 street) begs this very question. It has the raw horsepower and a stacked feature set to make its price tag seem like the laptop's a steal, and the system will appeal to business start-ups and bargain hunters alike. Yet if there's a fine line between conservative and just plain ugly, to most eyes this TravelMate will fall on the ugly side. Luckily, it makes up for its design faux pas with very good components and long-lasting battery life. TravelMate laptops have stuck with the same design ID for the past several years, including the murky gray-green color scheme, and this model is no different. At 9.5 by 13.2 by1.4 inches (HWD), the TravelMate 4720-6727 is about a quarter of an inch thicker than the Lenovo ThinkPad T61 Widescreen and the HP Compaq 6910p, making it seem heavier than its actual weight of 5.7 pounds. We recently declared that the HP Compaq 6910p might woo corporate users away from Dell and Lenovo; after spending some time with the $1,049 Acer TravelMate 4720, we think it's a prime candidate to woo users away from HP. The well-designed Acer exhibited admirable performance (which admittedly could be improved by adding RAM) and chart-topping battery life on our benchmarks, and its feature set includes nearly everything a business user will need. 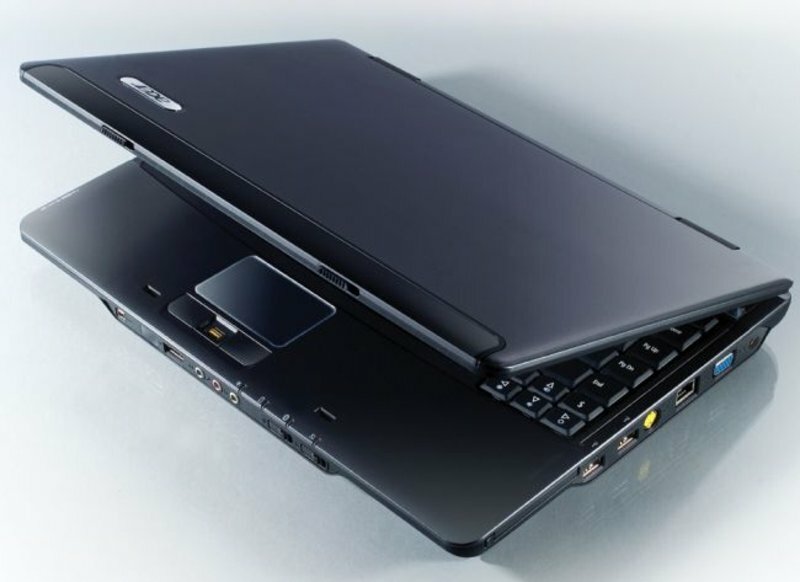 What it lacks: enterprise-level features such as a Trusted Platform Module or built-in WWAN, both of which are available on the HP Compaq 6910p and the Dell Latitude D630. Also, the TravelMate 4720's one-year warranty and limited phone support hours will fall short of many corporate users' expectations.